Who doesn’t love the satellite era League? Great stories, great art, and sandwiched between the mad as a box of frogs 60s stories and the Detroit League’s arrival. And hey look, it’s another Crisis . . .
Posted on Monday, January 21, 2019 Sunday, December 30, 2018 by GaryPosted in Mash-UpTagged Aquaman, Atom (Ray Palmer), Black Canary, Elongated Man, Flash (Barry Allen), Hawkgirl (Shayera Hol), Stargirl, Superman, Wildcat (Ted Grant). Not bad Gary. Not bad at all. The more you do this, the better you get. As to the on cover story, well it’s not like they’re not used to Wildcat showing up, but not the even older, gruffer version of Wildcat from the 00’s. This should be good. 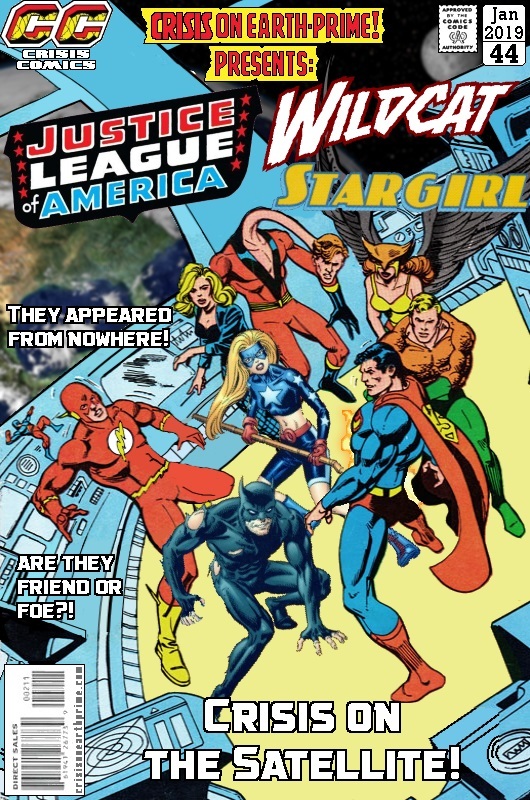 Thanks – I was happy with this one, especially as I not only had to remove Green Arrow but then had to “rebuild” a fair bit of the satellite once I’d removed the JLA logo as well. Huh. Well you definitely did a bang up job as they say on it.